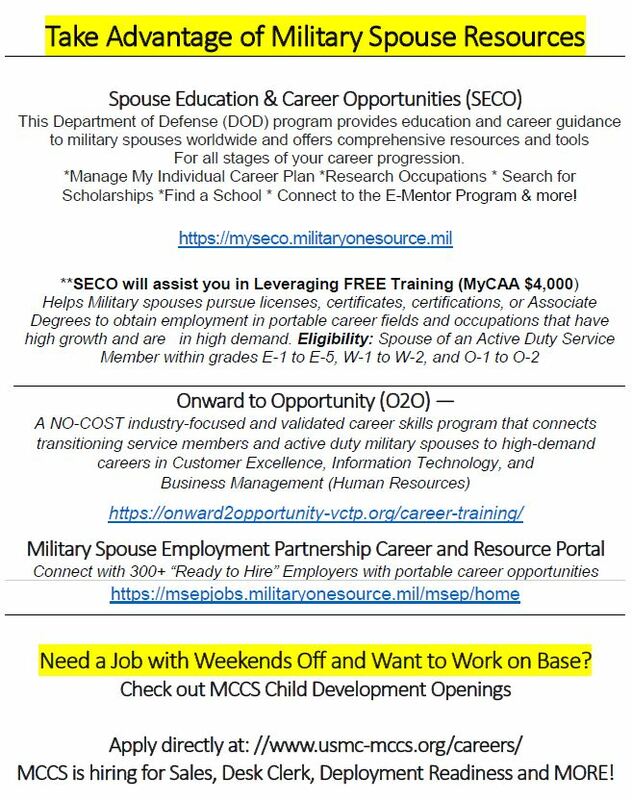 Spouse Education and Career Opportunities (SECO): The Department of Defense program provides education and career guidance to military spouses worldwide! 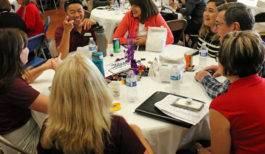 It also offers great tools and resources. 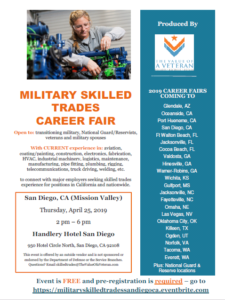 Onward to Opportunity (O2O): A NO-COST industry-focused and validated career skills program that connects transitioning Service members and active duty military spouses to high-demand careers in Customer Excellence, Information Technology, and Business Management (Human Resources). 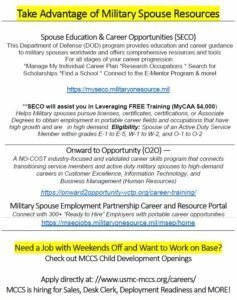 Military Spouse Employment Partnership Career and Resource Portal: Connect with 300+ “Ready to Hire” Employers with portable career opportunities. Need a Job with Weekends Off and Want to Work on Base? 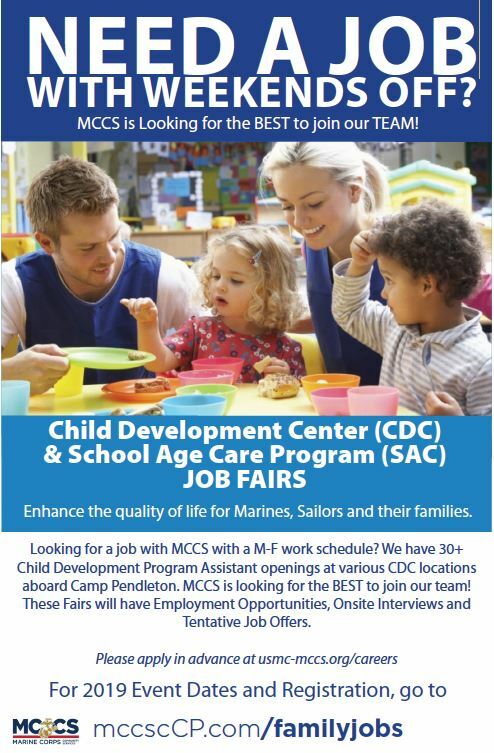 Check out MCCS Child Development Openings! 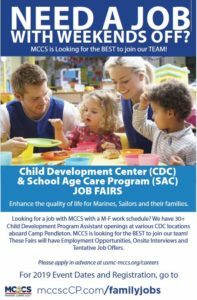 To receive weekly job listings compiled by Fleet & Family Support Center please email ffscjobs@mwrsw.com and put ADD in the subject line. 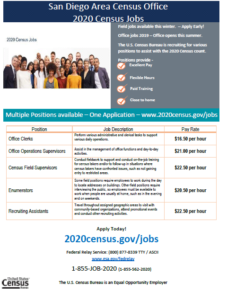 Point of Contact: To see job description or to apply, click job title above. Point of Contact: To see job description, click job title above. 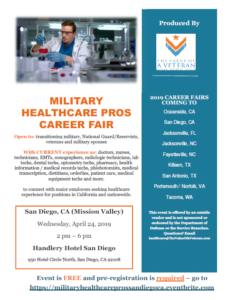 To apply please fill out attached application and submit to mosoutreach@militaryonesource.com. Point of Contact: To see job descriptions or to apply, click job title above. 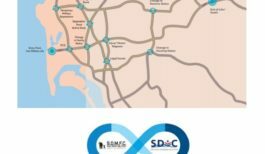 Point of Contact: Please visit http://bit.ly/2aGkVTQ which is our SAY Career Center to create a profile and submit your application online.